As I am still trying to recover from my flu/cold, I have not really been very productive. The ideas come to my mind and I just cannot find energy to make much of it. Today however, I made another one. 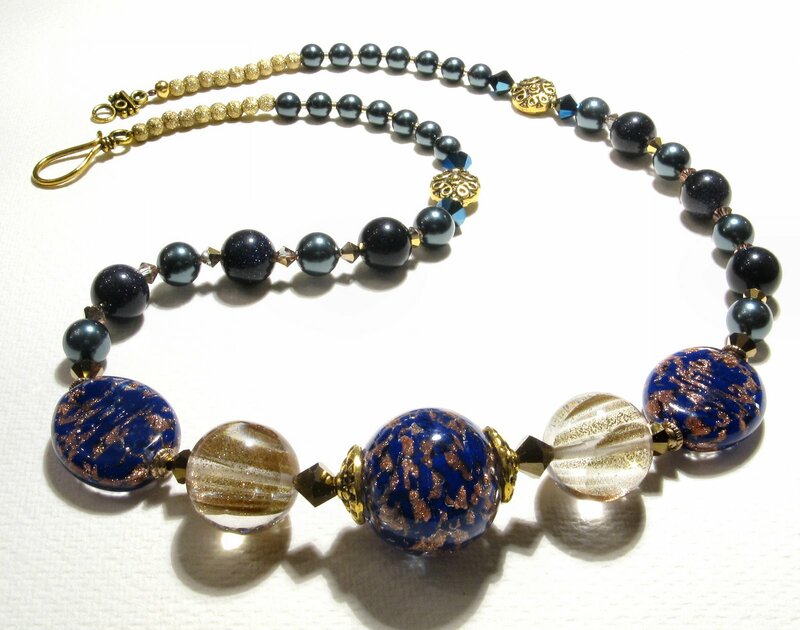 Just because sometimes I obsess about certain beads and cannot really rest until I lay out something. 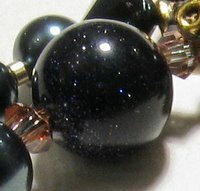 This piece is called La Notte (Italian for "the night"), and is a different colour from all other necklaces I made so far. I wanted to convey the idea of how nights looked like some years ago, when the city lights would not obliterate the shine of the stars and we could still see the Milky Way in all its glory. Not anymore, alas, unless we are far out in a remote spot in the country. 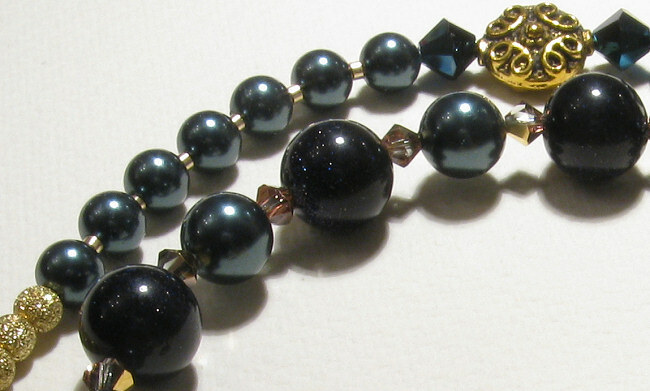 - Antique gold S-hook clasp. Details of the Sommerso dark navy beads with gold speckles, and some of the Swarovski pearls. Above, details of the lovely quartz beads with gold flecks. I am not sure if they are natural or man-treated. Either way, they are gorgeous and smooth, very unique. 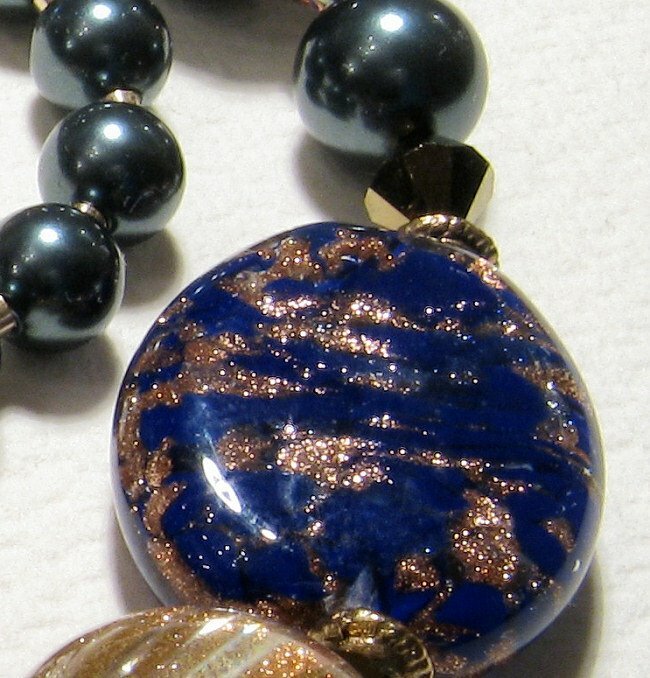 The last shot shows a detail of the blue sandstones. 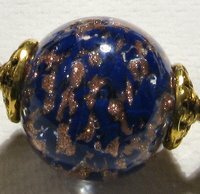 The tiny "stars" are copper impurities. 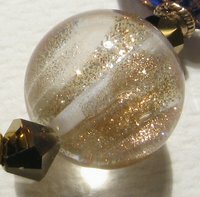 This is a kind of man-made stone, very pretty and composed by glass mostly (and other minerals). They look like they were immersed in star dust. The photos are unable to capture their whole luster, unfortunately. 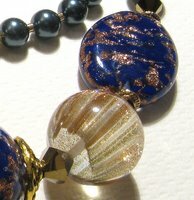 Details of the clasp and stardust antique gold spacers. 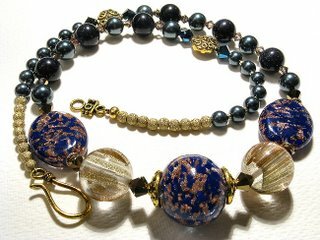 On the 2nd picture, we can see the Swarovski pearls and blue sandstone, along with some more Swarovski bicones and one of the ornate spacers. What I love about those Swarovski pearls is their tiny holes that are great for stringing, since they are very regular and well-drilled.